I’m currently working on some coptic stitch journals and wanted to show you the covers in progress. The pink paper I believe I got from Paper Arts a while back and the blue paper is an Italian print, a recent acquisition from Paper Source. I love the look of coptic stitch, it seems so simple but it’s so lovely. I had used this stitch before but it’s nice to revisit it and do some things a bit differently. For example, I set the holes for the threads at different intervals to create a different look. Once I have the journals assembled I promise to show you more detailed photos. Off to dream about some other books I want to make. Fun to see an in progress shot. I love that pink paper! Great job Ili! I love these. I can’t wait to incorporate these into my gift sets to add that special touch. I’m thinking with the right cover, these would be perfect for my Valentine’s Day gift sets. Very pretty! I love the pink, too. The pink is lovely! Can’t wait to see more photos! What gorgeous papers. I think I’d go crazy buying all the pretty paper if I were a bookmaker! nice to see the journals in progress; I’ll check back to see the finished product. So fun to see your work in progress. Looking forward to see more. 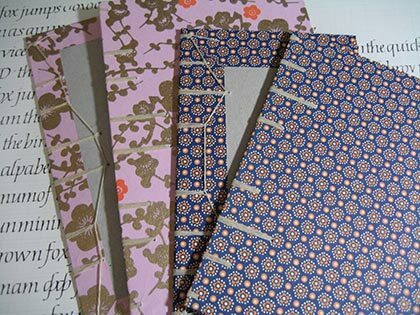 Hope your bookbinding class went well yesterday! Beautiful. I hope that your fingers aren’t hurting. It looks a bit painful to do. These are so gorgeous! Making your own books must be a very fulfilling task. They’re lovely! I especially love the pink paper. 😉 I can’t wait to view the finishing works. Shadan – I can’t wait ’til we can do something like that again girl! Les in NE – thank you. That paper is so nice to work with too – soaks up the glue really nicely and without too much crinkling. Dawn – Thank you and I promise to post pics of the finished books! maggie – I think so too! As I didn’t cover the inside though I will have to cover the stitching but maybe I’ll do some other kind of journal where I cover the entire book board so the stitch can be seen from the inside too. Tiffany – I still have some of the pink paper left and am thinking of what else I can make with it. Ruth – It is. I love bookbinding. To me it’s just a nice way to honor and keep alive a very old tradition! So very cool to see your work in progress! It always looks to amazingly precise and perfect and of course beautiful! Beautiful! I treasure the one you sent me! Dreaming of books to make is a great way to dream! Love the lilac colored one especially! Stefanie – I forget to take pics in progress and I should do more. I just love seeing how a book starts with some papers and boards! Carl V. – Indeed! 🙂 Ah, I’m so glad I have more of that paper as I messed up on that book. Maybe I’ll re-create it or just try a whole new book structure. We’ll see! Do you have any links to book making sites? I have played with making books but I love the way yours are stitched together. I love those covers, Iliana! You are so talented. Juliann – I sent you an email with some info. I hope that helps. I’d love to hear how it goes so hope you’ll keep in touch.